A soft light pink blush infused with a tint of peach. 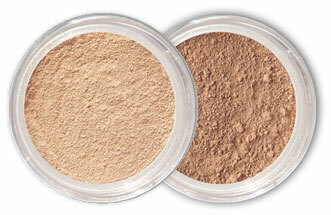 A crowd favorite for skin tones with Fair to Light complexions. I have tried so many foundations, and were just about to give up.. When I heard about Mineral Hygienics I thought that it would not hurt to try it. I AM SOOOOO GLAD I DID!! It leaves my skin feeling great and looking awesome. No flakes on my skin, no oily spots, and it covers perfect - AND looks natural. Even after a day at work and exercise in the evening it looks perfect, it's magic! I have combination and acne prone skin that have problems with dehydration and sensitivity. foundation. Thank you Mineral Hygienics for making such a great quality and affordable product. I will continue to sing your praises to all of my friends. I love your products! I have never worn under eye concealer, since I always found that it left two half moons caked under my eyes. The cure, in effect, seemed worse than the disease. Once I tried your wonderfully natural foundations, I gave your under-eye concealer a try and I have not been without it since! My friend had this on once when she visited, I tried it on and my skin was flawless. She said she could sleep with it on at night without any problems! I've been wanting too buy it ever since! My skin feels dewy.I just can't say enough.....LOVE! pleased. I can't wait to order other makeup. And your service is awesome. I got my makeup in 1-2 days after order. I've never ordered anything online that shipped so fast. I would recommend this to everyone. Why isn't everyone wearing this? Wow! I am really amazed how good this is! It looks so natural, as I am not wearing any makeup at all, just happens to have the most flawless perfect skin:-) and my skin is not itching any more as it did with other mineral foundations due to the bismuth. And also impressedby the fast delivery time, less then one week, to Norway! I started using Maybelline Mineral Makeup several years ago. I thought it was good but wanted something with just a little more coverage. I wanted to try Bare Escentuals but just didn't like the hype around it. I had been using Mineral Hygienics for about a year and absolutely loved it when Bare Escentuals dropped their price. I bought a small sampler and tried it for one day. I will not use it again. The coverage and fine powder of Mineral Hygienics is by far the best of the three. Coverage, color, brushes, price...everything is better. Customer service is fantastic too! No more trying different products, just sticking with Mineral Hygienics! My skin has been the most sensitive skin that ever graced the earth -I have suffered rosacea, eczema, spots, and redness and irritation and I cannot wear most forms of make-up with them over-drying or plainly irritating my skin, and therefore I have kept away from most things after trying everything including most forms of mineral make-up. Mineral Hygienics was different - the four sole ingredients were pure; blended into my skin easily and covered well and did not irritate my skin to the point that after several months of use my skin became incredibly good - so much so - that after a while I did not bother to wear make-up much at all; and therefore these days I have such a stock of Mineral Hygienics in my bathroom that it will keep me going for months to come! © Mineral Hygienics 2019 - The brand you wear, when you want to look incredible! Share why you love Mineral Hygienics! We'll give you a free coupon code! Thanks for Sharing! Keep it up! Copy this code and use it during checkout.